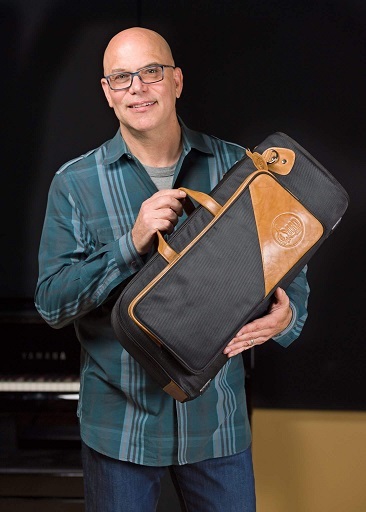 Dan Fornero with his GARD Elite 1-ESK Single Trumpet Gig Bag. Dan Fornero is an LA-based freelance trumpet player who has toured the world with Woody Herman, Tom Jones, Brian Setzer Orchestra, Johnny Hallyday, Phil Collins, Neil Diamond and Mumford & Sons, among others. Born in April 3, 1959, Dan Fornero originally hails from from Kenosha, Wisconsin, USA. He attended the North Texas State University from 1977-81, where he played his first trumpet in the famed One O'clock Lab Band in the years 1980 & 1981. Moving to Los Angeles in 1982, Dan left for a year on the road playing lead trumpet with Woody Herman. In 1988 he began a three-year tour with Tom Jones. In 1991 he became a founding member of the Vine Street Horns and began recording and touring with many great artists. Dan was a forming member of the Brian Setzer Orchestra in 1991. 1993 brought another tour with Tom Jones in addition to a Vine Street Horns tour with Al McKay & The LA Allstars, performing the incredible music of Earth Wind & Fire. World tours soon followed with Phil Collins and the great French rocker Johnny Hallyday. In 2001 Neil Diamond was added to his touring list, and from 1993-2005 Dan found himself touring the world several times over between the different artists he'd worked with. In 2003 he became a member of the Gordon Goodwin Big Phat Band, sharing the lead trumpet responsibilities with Wayne Bergeron. Batman Returns, The Player, The Mask, Hancock, Head Of State, Bad Santa, Race To Witch Mountain, The Whole Ten Yards, Polar Express, Robots, Ice Age 2: The Meltdown, Ice Age 3: Dawn Of The Dinosaurs, Happy Feet, The Simpsons Movie, Meet The Robinsons, Horton Hears A Who, Semi-Pro, G-Force, What Happens In Vegas, Hairspray, The Brothers Warner, Welcome Home Roscoe Jenkins, Bah Humduck, Beverly Hills Chihuahua, Evolution, Bolt, Pink Panther Deux, Tooth Fairy, The Princess & The Frog, Rio, Mars Needs Moms, Knight And Day, Toy Story 3, American Idol, America's Got Talent, Celebrity Duets, Boston Legal, Brothers And Sisters, Day Break, Home Improvement, The Simpsons, Memphis Beat, Dancing With The Stars, The Grammy Awards, The Emmy Awards & many others. Dan has also performed with various artists on Jay Leno, David Letterman, Conan O'Brien, Jimmy Kimmel, Ellen, Rosie O'Donnell, Larry King, Dennis Miller, Arsenio Hall, Jon Stewart, and more. Dan Fornero is currently living in Los Angeles enjoying life as a freelance performer.